First Lieutenant Doyle M. Hufstedler, 25, of Abilene, Texas. Specialist Michael G. Karr Jr., 23, of San Antonio, Texas. Private First Class Cleston C. Raney, 20, of Rupert, Idaho. Private Brandon L. Davis, 20, of Cumberland, Maryland. They fought together, they died together, and Friday morning all five were buried together at Arlington National Cemetery. The five soldiers from the 1st Engineer Battalion -- Lieutenant Doyle Hufstedler, Specialist Sean Mitchell, Specialist Michael Karr Jr., Private First Class Cleston Raney and Private Brandon Davis -- were killed March 31, 2004, when their armored personnel carrier ran over a bomb in Iraq's Sunni Triangle. They were the 69th, 70th, 71st, 72nd and 73rd casualties of Operation Iraqi Freedom to be buried at Arlington. Hufstedler was from Abilene and Karr was from San Antonio. In the 11 weeks since their deaths, the remains that could be positively identified were given to their families, who held individual funerals in their home towns. What could not be identified from the wreckage was commingled, placed in a single 18-gauge steel casket and buried Friday. They will receive a single gravestone that will include all five names. Four of the five families attended Friday's ceremony, which included a horse-drawn caisson, U.S. Army band and a volley of three shots fired by seven soldiers followed by Taps played in front of a backdrop of granite and grass. The caisson was the same used for the funeral of President Ronald Reagan last week. Wearing a pink-and-white dress and cradled in her mother's arms was Grace Ashley Hufstedler, born five weeks after her father's death. The family of Sergeant Mitchell declined the Army's invitation to attend Friday's ceremony. Hufstedler, 25, knew he wanted to be a soldier early on. He was an Eagle Scout, cadet commander of his high school ROTC program who called elders "sir" and "ma'am." At Texas A&M, he enrolled in the school's Corps of Cadets, a military program that required daily drills and wearing a uniform to classes. He proposed to his college sweetheart, Leslie, in the end zone during a football game, a tradition at Texas A&M. Karr, 23, was a star student at South Garland High School near Dallas, but he was also a free spirit. The redhead with a great sense of humor left the University of Texas to join the Army, where he was a medic assigned to the 1st Engineer Battalion. Karr's mother, Kim Sine, is a high school teacher, and her son was an enthusiastic pen pal to her students. They fought together, they died together, and yesterday morning all five were buried together with full military honors at Arlington National Cemetery. 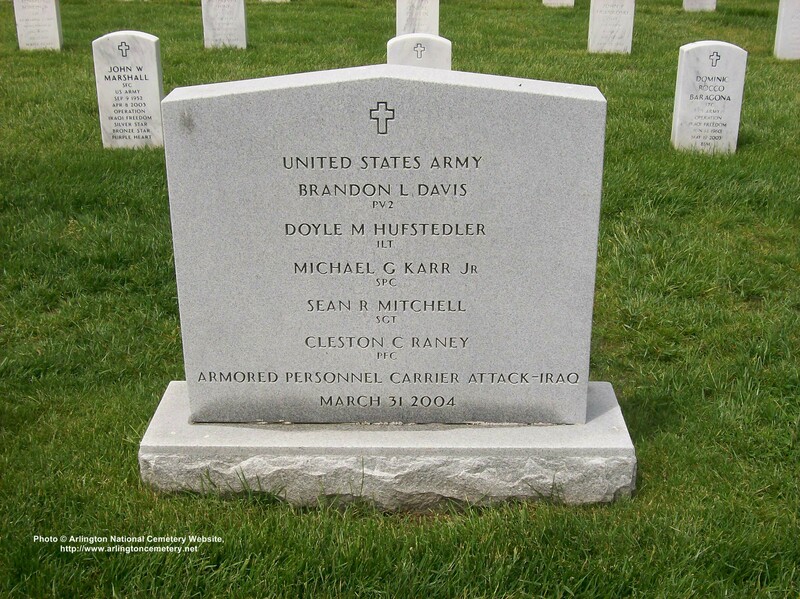 The five soldiers from the 1st Engineer Battalion -- Lieutenant Doyle M. Hufstedler, Specialist Sean R. Mitchell, Specialist Michael G. Karr Jr., Private First Class Cleston C. Raney and Private. 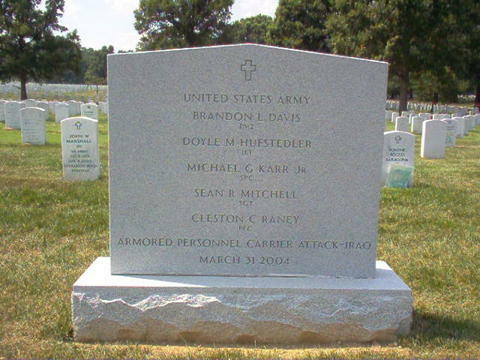 Brandon L. Davis of Cumberland, Maryland -- were killed March 31, 2004, when their armored personnel carrier ran over a bomb in Iraq's Sunni Triangle. They were the 69th, 70th, 71st, 72nd and 73rd casualties of Operation Iraqi Freedom to be buried at Arlington. Yesterday's ceremony was the first group burial of the Iraq war. In the 11 weeks since their deaths, the remains that could be positively identified were given to their families, who held individual funerals in their home towns. What could not be identified from the wreckage was commingled, placed in a single 18-guage steel casket and buried yesterday. They will receive a single gravestone that will include all five names. Four of the five families attended yesterday's ceremony, which included a horse-drawn caisson, U.S. Army band and a volley of three shots fired by seven soldiers followed by taps played in front of a backdrop of granite and grass. The caisson was the same used for the funeral of President Ronald Reagan last week. "Whether it be for presidents or privates, honors are rendered to those who served and sacrificed for our nation," Army Chaplain Kenneth Kerr told family members at the graveside. Later, Kerr knelt before mothers and widows, whispered the gratitude of the nation and -- four times -- handed over a crisply folded American flag. The family of Sgt. Mitchell declined the Army's invitation to attend yesterday's ceremony. After attending his funeral, a memorial service at Fort Riley, Kan., and other salutes, the Mitchell family felt that attending another emotional ceremony was too much to bear, according to an Army spokeswoman. "The Mitchell family just decided they just couldn't do this one," said Shari Lawrence, an Army public affairs officer who served as liaison to the five families. Group burials are relatively rare at Arlington. The last group funeral there was for four airmen and a soldier who died when their helicopter crashed in Afghanistan in November. Family members were not available for interviews yesterday, but friends and family members had earlier told The Washington Post that each of the men was committed to duty. Hufstedler, 25, of Abilene, Tex., knew he wanted to be a soldier early on. He was an Eagle Scout, cadet commander of his high school ROTC program who called elders "sir" and "ma'am." At Texas A&M, he enrolled in the school's Corps of Cadets, a military program that required daily drills and wearing a uniform to classes. He proposed to his college sweetheart, Leslie, in the end zone during a football game, a tradition at Texas A&M. Mitchell, 24, of Youngsville, Pa., was serving his second tour of duty in Iraq. After returning home from Iraq last year, he was scheduled to leave the Army. But like thousands of others, he was prevented from doing so by orders designed to maintain troop levels. After less than two months at home, he was sent back to Iraq last fall. Mitchell was a big, broad-shouldered man and avid fisherman who loved football and wrestling. After receiving an associate's degree in business administration, he signed up in the Army as a combat engineer. His wife, Denise, was a leader of an Army Family Readiness Group, which helps support other military families. Karr, 23, of San Antonio, was a star student at South Garland High School near Dallas, and a free spirit. The redhead with a great sense of humor left the University of Texas to join the Army, where he was a medic assigned to the 1st Engineer Battalion. Karr's mother, Kim Sine, is a high school teacher, and her son was an enthusiastic pen pal to her students. When Karr died, one of them wrote a poem in his honor. "War takes always what we love the most. We're just the guests, but God is the host. Who's to say what he could have been -- doctor, lawyer or congressman," wrote Michael Shrum, a seventh-grader. "And as we grow older and older, keep in your mind our personal soldier." Michael attended the funeral. Raney, 20, of Rupert, Idaho, was a quiet, shy, only child who was raised by an aunt. He surprised his family when he told them he was enlisting in 2002. They tried to talk him out of it, a cousin, Gina Trivitt, told The Post earlier this year. "One of the things he said was he didn't want someone to say down the road, 'Whatever happened to the Raney kid?' and for somebody to say, 'I don't know,' " Trivitt said. "He had a sense of purpose." Davis, 20, was the class cutup who was suspended from school after attending his eighth-grade dance in drag. He had joined the military to learn a trade, start a career. In February, he had a chance to return home, but gave up his leave to a friend who was about to get married, relatives said. The five met their end on a road in Habbaniyah, a town west of Baghdad in an area known for insurgent activity. Their M-113 armored personnel carrier ran over a bomb, possibly detonated by remote control. The military said the incident is under investigation.